Probiotics Could Help Reduce the Severity of Flu Symptoms. The flu has been haunting the good health of North America for centuries. Every year, new strains appear. Thousands of people find themselves struggling with symptoms that affect breathing and the ability to eat and sleep. The flu can wreak havoc with the body’s hydration system. Vomiting alternating with bouts of diarrhea can cause the body to lose fluids too quickly and for too long. When caught in a vortex of symptoms like this, many are forced to head to the emergency room at the local hospital. There is no one treatment that can successfully treat the flu. Sometimes medication is prescribed, in the form of antiviral meds aimed at preventing serious complications. Antibiotics have also been used to help treat flu symptoms. Decongestants are prescribed to relieve sinus infections and pain relievers are pressed into service to reduce fevers and keep body temperature near normal. Eventually, with this multi-faceted treatment, most patients recover. 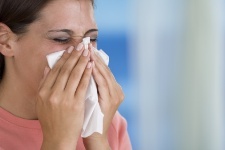 Researchers continue to look, however, for a definitive treatment that will stop flu symptoms in their tracks. Just recently, researchers began investigating probiotics as a potential weapon against the flu bug. Probiotics are full of friendly bacteria that have been shown to aid in digestion. The friendly bacteria in probiotics also help fight candida, harmful bacteria that can over-run the body and cause all kinds of unpleasant symptoms. Preliminary studies are showing that probiotics do indeed have a beneficial effect on flu symptoms and may help get rid of the flu. One interesting study conducted in Spain tried to determine if lactobacillus plantarum—a bacteria commonly found in probiotics—could help boost the effectiveness of a flu vaccine. Sixty seniors volunteered to participate in the trial. All were given a flu vaccine. They were then given probiotics for three months after vaccination. According to the researchers, the probiotics increased the levels of influenza antibodies in the patients. Another clinical trial, performed in Australia, looked at the effect of probiotics on athletes suffering from gastrointestinal and upper respiratory-tract illnesses. Sixty-four competitive cyclists were recruited. The researchers noted a substantial reduction in the severity of gastrointestinal illness in the male athletes taking probiotics. The same could not be said for the female athletes who showed only small improvements in respiratory illness symptoms when taking probiotics. A new, large scale study is now being planned that will involve 900 children. The study will focus on the effectiveness of a probiotic called “Lacidofil.” The researchers hope the Lacidofil will prove to be an effective treatment for gastroenteritis. By relieving symptoms, probiotics could go a long way to making the flu less severe and taxing for the body. It will be interesting to see what the results show at the completion of this Canadian study. If probiotics can be harnessed to relieve flu symptoms, this is great news for all of us. Probiotics are economical when compared with the price of over-the-counter meds. Probiotics have also been proven to be safe for patients with no reports of adverse events. Bosch, M., et al., “Lactobacillus plantarum CECT7315 and CECT7316 stimulate immunoglobulin production after influenza vaccination in elderly,” Nutr Hosp. March-April 2012; 27(2): 504-9. West, N.P., et al., “Lactobacillus fermentum (PCC®) supplementation and gastrointestinal and respiratory-tract illness symptoms: a randomised control trial in athletes,” Nutr J. April 11, 2011; 10: 30. “Calgary Study Examines Probiotic to Treat Tummy Troubles,” CTV news web site; www.ctvnews.com, last accessed online June 6, 2013.